Bicycles used as vehicle to deliver the Gospel Thank you for helping . . . Thank you for helping provide bicycles to people around the world. In remote villages, having a bicycle for transportation makes all the difference. It can help a child travel to school easier, allow parents to carry more goods to market, and even save a life if someone needs medical help quickly. Your gift has truly transformed people’s lives. 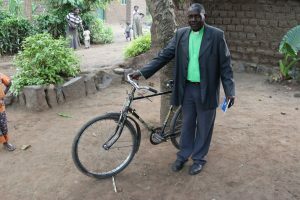 Bicycles can even help pastors like Cyprien and Rev. Nsekanabo reach more people with the Gospel than they ever could before. Thanks to gifts like yours, the hope of Jesus is traveling via bicycle across countries like India, Guatemala, Rwanda, and more. Isaiah 52:7 says, “How beautiful upon the mountains are the feet of him who bring good news …” (ESV). Cyprien’s feet are dusty, but they are certainly beautiful. For more than 15 years, Cyprien has been a leader at his church in Rwanda, sharing about Jesus with his friends and neighbors. But he didn’t just stay close to home. Cyprien was determined to share the Gospel with as many people as possible. Three days a week, he would walk over an hour and a half to minister at a church he helped plant near the Rwandan border. The treks were long and hard, but Cyprien was dedicated to his mission. 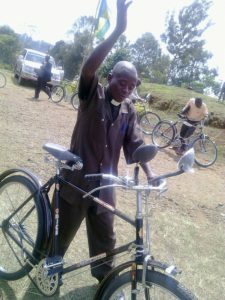 Thankfully, Cyprien was one of several pastors and church planters in Rwanda who received a bicycle. As they were given the bikes, each of the pastors was reminded of Jesus’ command in Matthew 28:19 to “go and make disciples.” Cyprien was already doing that, but he was limited by how far and how fast he could walk. Now, he can more easily travel to where the Lord calls him. “I am very thankful to the people the Lord used to provide this [bicycle] for me,” Cyprien said. Thank you for allowing the Lord to use you to bring bicycles to people like Cyprien — and to bring the Gospel to the nations! Of all the things he loves to do, Rev. Nsekanabo loves two things most of all. He loves to share the Word of God with others, and he loves spending time with his wife and four kids. There was just one problem. 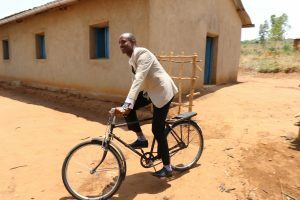 With no access to any kind of transportation, he had to walk to every home and village he visited as part of his ministry throughout Rwanda’s Bugarama Valley. Those walks could take hours — hours that could be spent sharing the Gospel with more people or playing with his children. Then, one day, he received a bicycle. “This is one of the [best] surprises that I have ever received,” Rev. Nsekanabo said. Now, he is able to maximize his time in ministry and his time with his family. Because of his bicycle, Rev. Nsekanabo can get to services faster, make home visits to more people around the valley, and get home sooner to his wife and kids. A bicycle may seem like a simple gift. After all, it’s something you might have received as a child! But for Christians like Rev. Nsekanabo, a bike is crucial to the spread of the Gospel. It’s so much more than just a means of transportation — it’s a vehicle for the Good News! Thank you, again, for sending bicycles to men and women like these pastors in Rwanda. You are truly making an impact that will outlive you and last for eternity.